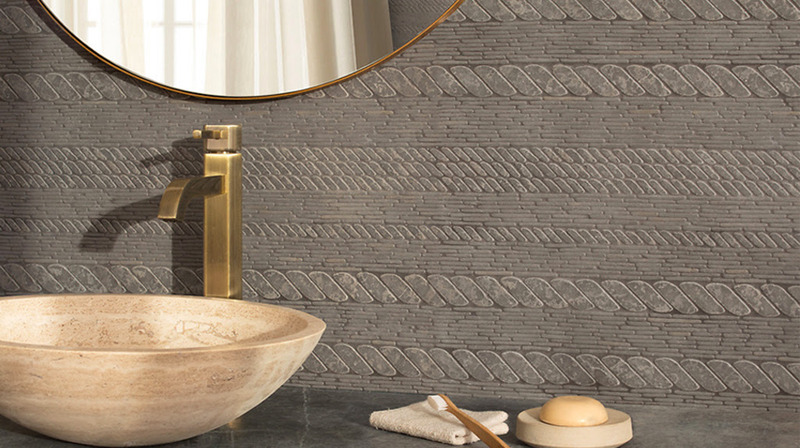 Cane Weave, a hand-cut stone mosaic, shown in honed Cloud Nine. 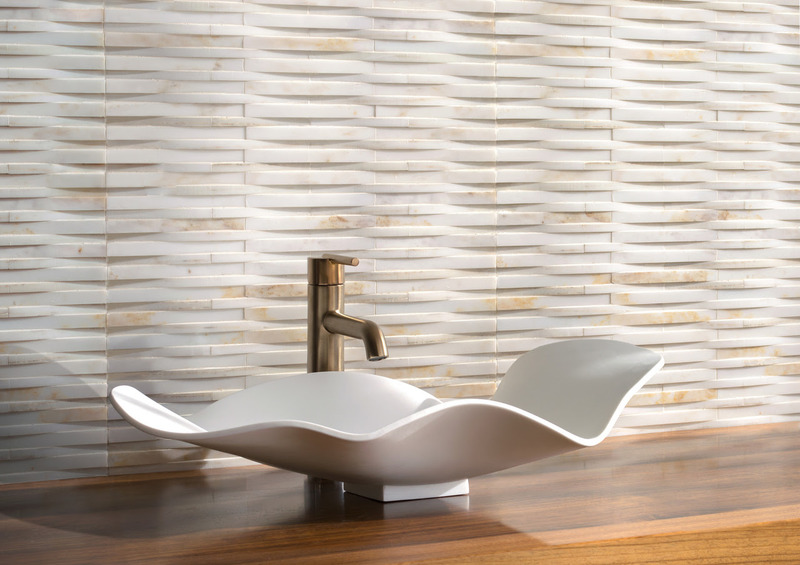 New Ravenna, America’s premier designer and manufacturer of mosaics for both residential and commercial installations, is pleased to introduce Tissé, a collection of 23 mosaic designs inspired by international weaving techniques and techniques and textiles. Tissé, which means “to weave” in French, explores the structure of the raw materials and techniques of heritage designs used in textiles and upholstery. Traditional fibers like Rattan, Jute, and Esparto are interpreted in stone colors that represent the original plant strands. Woven designs like Tweed, Gingham Chevron, Cabin Weave, Wicker, and Twill Ombre were designed first by separating fabric threads to understand how the textile was created. For the Cardigan (shown above) and Cable Knit mosaics, individual stitches were photographed and enlarged to recreate the intricate permuting patterns. For the Cardigan and Cable Knit mosaics, individual stitches were photographed and enlarged to recreate the intricate permuting patterns. Thomas, Corduroy and Cane Weave emulate the three-dimensional quality of heavily textured materials and are suitable for vertical installations. Either subtle or dramatic contrasting color patterns are the highlight of Maya, Perseid, Indira, and Ziggurat. Individual stone pieces were then hand cut, tumbled or given a Venetian (pillowed) effect to soften the stone with a more rounded finish. Darker grout was applied to create shadows and depth between each piece of stone, glass, and shell. The Tissé collection and all other New Ravenna mosaics are available at New Ravenna showrooms throughout the United States, Canada, Europe, Russia, and Dubai. Visit www.newravenna.com for more information, or call (757) 442-3379.